Start your day with a balanced combination of sweet, nutty, creamy and crunchy. This light, yet satisfying, Papaya Coconut Bionico comes together fast and makes breakfast nutritious and fragrant while giving it just the right amount of sweetness! January comes with the excitement of new resolutions for the New Year. I like challenging myself to try new things, learn new skills, and improve my life. I bet you do, too. I’ve written in the past about how much easier it is to start with one small resolution, until it becomes a habit, then moving on to another, and maybe trying one new resolution per month throughout the year. Well, my first microresolution for January 2019, then, is to start each day with a nutritious breakfast. Checkout my first go-to breakfast for January: Papaya Coconut Bionico. Bionico, known in some parts of México as energético, describes a popular Mexican fruit cocktail topped with granola, coconut, nuts and a vanilla sweet cream, usually made with sweetened condensed milk. My recipe is lighter and faster, though. 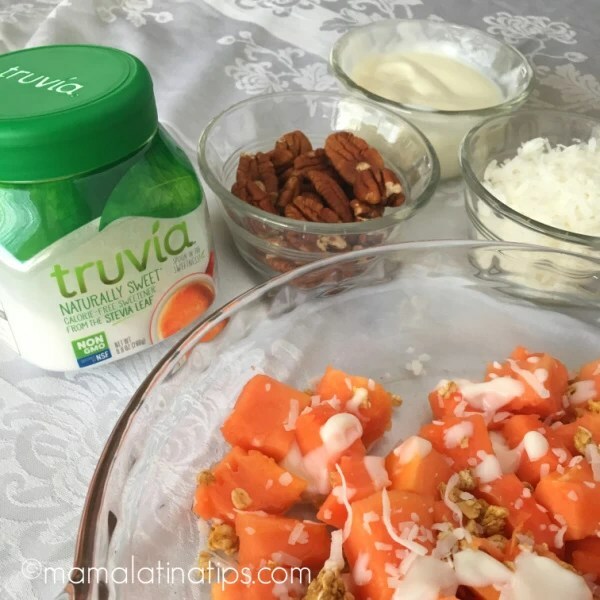 My version swaps out the sweetened condensed milk for plain yogurt, deliciously sweetened with Truvía® Spoonable, and flavored with vanilla extract. If you’re not familiar with Truvía Spoonable, its sweetness comes from stevia leaf extract, and stevia leaf extract comes from the sweet leaves of the stevia plant. So spoon in the sweetness, each serving is zero calories! Bionicos often involve a mix of several fruits like cantaloupe, strawberries, bananas, honeydew and papaya. I chose to use just papaya for this one, because I love papaya and I can usually find it any time of year. Plus, I wanted to suggest this simplified recipe to make it easier for hurried mornings. If you make this Papaya Coconut Bionico, be sure to snap a photo and share it with us on social media using the #mamalatinatipsrecipes hashtag. I’d love to see it and have a chance to share it as well. Mix together plain yogurt, Truvía Spoonable, and vanilla extract with a spoon. Set aside. Place chopped papaya in a platter or bowl. Add coconut and carefully combine them. Sprinkle with pecans and granola to taste. Pour the sweet yogurt mixture on top and serve immediately. The perfect start to our day and our year. Happy New Year. Start your day with a balanced combination of sweet, nutty, creamy and crunchy. This light, yet satisfying, Papaya Coconut Bionico comes together fast and makes breakfast nutritious, fragrant and with just the right amount of sweetness! This looks delicious and like a nice healthy option that I think my kids would even love. 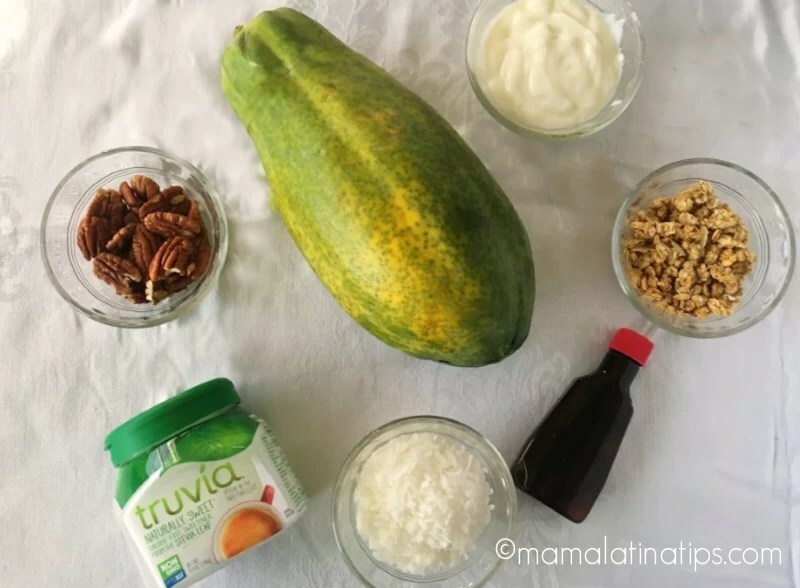 We don’t usually eat a lot of papaya so this would be a fun change to try out. I love eating papaya but never thought of mixing it with vanilla! this surely sounds yummy and healthy! I keep seeing papaya at the store. Now I need to make this dish as it looks so yummy. This looks like a tasty dessert. I need make this one day. I think I’d like the blend of flavors. Mm, this sounds so fresh and delicious. Papaya is my Mum’s favourite fruit, and I adore coconut – so we definitely need to try this! This simple yet delicious recipe comes in handy for quick breakfast and/or snacks. I normally would not be a fan of coconut but I am willing to give it a try. 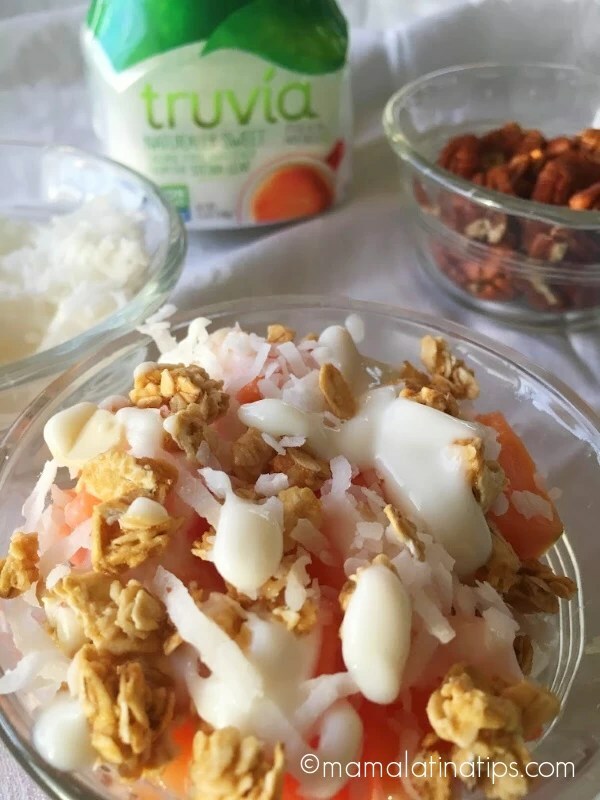 You can always omit the coconut and add more granola. It sounds great! Thanks for sharing with your mom. This looks so tempting. I think I’m going to give it a try! Please do, and please come back and let us know how you like it. Yummy you got me at papaya and bionico love both and better if are sugar-free. Thanks, amiga for the inspiration need to try this snack at home. I would always love to start my day with a healthy breakfast. This is so easy to make. It will definitely be part of my new learned recipes. How I love fruit cockails…I love them whipped with vanilla ceam too. Anyway, the bionico looks so yummy and it might convince me to take it even though I don’t love papaya. While I love all fruits and veggies, papaya is the one fruit I just can’t enjoy. It has a very strong flavor. Though my kids and husband LOVE it. This looks like it would be so delicious. I have never heard of anything like this before. I have never tried papaya but my step mother swears by it. I’ll have to pass this along for her to try. I know she would enjoy it. You haven’t!?! I invite you to give it a try. Perfect to start the day!!! So yummy and healthy. Love the combination of flavor in this recipe. Thanks for sharing! Love papaya! This is such a good idea to start the day in a very healthy way. Thanks for the tip.